Do you ever sign up for a yoga class and then cancel at the last minute because you are convinced that won’t be able to clear your mind? It’s time to stop the excuses! 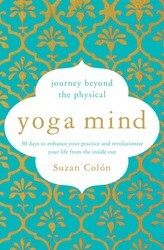 Suzan Colón, author of YOGA MIND, shares why focusing on mindfulness is the right path for you. Although mindfulness is not a substitute for mediation, it has its own benefits and can help you find a better meditation experience. There are lots of different ways to meditate, but generally, meditation means focusing on one thing, such as your breathing, an uplifting image, a candle flame, or a phrase you repeat (a Mantra). As you focus, you gradually become absorbed with the object of your meditation, and your mind becomes calmer. If any of these have kept you from meditating, there’s something else you can try: mindfulness. Being mindful ranks right up with happiness as one of our top spiritual aspirations. But with screens everywhere—in our hands, on our desks, in our homes and cars, even in restrooms—the ability to focus is like an endangered species. Add in the brain’s tendency to become addicted to social media, and you may be experiencing more roadblocks to meditation than ever. By paying attention to what you’re doing—in other words, being mindful—you’re giving the brain something to focus on. That gently guides it away from thinking without fully distracting you. The single-pointed focus of mindfulness makes your ability to concentrate stronger. We’re most often encouraged to be mindful during activities where we tend to go on autopilot and attempt to multitask, such as washing dishes. Because these activities are simple, they’re prime opportunities to notice one of the benefits of mindfulness: the negative narrative in your head goes quiet. In fact, simple tasks done mindfully don’t invite much internal dialog at all, which is relaxing. 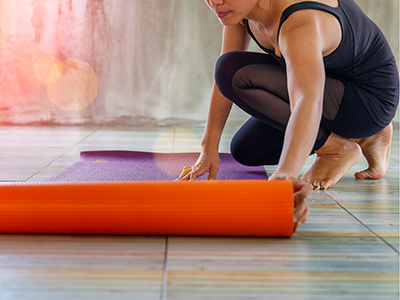 Think of doing Yoga, where you have to focus on putting your body in a certain pose while making sure you don’t strain. Finding the sweet spot between effort and ease produces a good feeling, and it’s all about mindfulness. Another great mindfulness exercise: knitting, which gives you a point of focus while soothing your hands with the soft, tactile sensation of yarn caressing your fingers. If your thoughts are too troubling to sit with, or you have trouble sitting still, doing something mindfully can give you a sense of accomplishment, as well as a feeling of peace. Taking a walk, washing the dishes, doing Yoga, knitting, drawing, and other mindfully-done activities produce tangible results, adding satisfaction to your serenity. While we may only get to sit in meditation once or twice a day, we can practice mindfulness all day. By doing each thing you have to do mindfully, you’ll have less of that burned-out feeling at the end of the day, you’ll accomplish more, and you’ll perform the tasks better. So, what do you have to do to be mindful? It’s simple: Just focus. Bring your attention to whatever you’re doing, and just do that one thing at a time. It may seem strange not to do a bunch of things at once, but keep at it, and you’ll soon be a mindfulness master. Reclaim your mind with an emotional detox.